This is the mini helmet display cases category. In this category, you will find mini helmet display cases for 1 mini helmet, 2 mini helmets, 3, 6 and 16 mini helmet models. The 16 mini helmet display cases are our most popular. 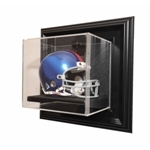 Our mini helmet display cases are available in both desktop and wall mountable designs. please leave the fields blank. Overall dimensions are 28-3/4"W x 23-7/8"Hx 5-1/8"
Wall mountable triple mini helmet acrylic case for football, baseball, or hockey helmets, with black base and gold risers. Features optically clear, richly beveled UV protected acrylic, all handcrafted and polished to a high luster This is not one of those cheap, mass produced display cases. This is a high quality investment in the protection of your memorabilia collection. Full mirror back Price includes up to 3 free nameplates. Additional nameplates are available. Wall mountable double mini helmet acrylic case for football, baseball, or hockey helmets, with black base and gold risers. Features optically clear, richly beveled UV protected acrylic, all handcrafted and polished to a high luster This is not one of those cheap, mass produced display cases. This is a high quality investment in the protection of your memorabilia collection. Full mirror back Price includes up to 2 free nameplates. Additional nameplates are available. or hockey helmets, with black base and gold risers. Price includes 2 free nameplates. Desktop mini helmet acrylic case for a baseball batting helmet on a stand. This case is specially made to hold a baseball mini helmet. It is slightly larger than a standard mini helmet case, so the helmet is upright in the case. Features optically clear, richly beveled UV protected acrylic, all handcrafted and polished to a high luster This is not one of those cheap, mass produced display cases. This is a high quality investment in the protection of your memorabilia collection. Price includes 1 free nameplate. Wall mountable mini football helmet acrylic case with black base and gold risers. This is similar to our desktop case, but with a wall mound bracket on the back. Features a full mirrored back. Also features optically clear, richly beveled UV protected acrylic, all handcrafted and polished to a high luster This is not one of those cheap, mass produced display cases. This is a high quality investment in the protection of your memorabilia collection. Price includes 1 free nameplate. Desktop mini football helmet acrylic case with black base and gold risers. in the protection of your memorabilia collection. Full mirror back. or hockey helmets, with black base and clear back panel. or hockey helmets, with black base and mirrored back panel. 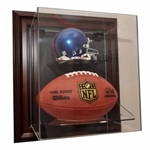 Acrylic display case for a football or hockey mini helmet. is fully stackable. Comes with 1 free nameplate. Additional nameplates are available. New from Ball Qube - REDUCES 98% OF HARMFULL UV RAYS. Two piece design is fully stackable. Interior Dimensions: 5.06" x 5.06" x 7". Comes with 1 free nameplate. 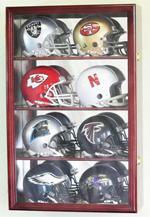 Acrylic display case for a football or hockey mini helmet. Two piece design is fully stackable. Your choice of a clear back (standard) or a mirrored back panel. Interior Dimensions: 5.06" x 5.06" x 7". Comes with 1 free nameplate. Additional nameplates are available.